September wasn’t as productive a month writing-wise as August, but it was still pretty good. I turned out a decent number of pages, the deal with Ramble House for the short story collection came about, and Livia sold the fourth book in her Fresh-Baked Mystery series. If October goes as well, I’ll certainly be pleased. GREEN LANTERN: THE GREATEST STORIES EVER TOLD, John Broome, et al. Not a bad one in the lot. I didn’t write blog posts about all of them, because I was either too busy, too tired, or I wrote about them for the Owlhoot apa and like to have those reviews appear there first most of the time. You can read anything in that list, though, and be assured of some entertainment. We saw the following movies in September: THE EX, THE MARINE, DÉJÀ VU, WILD HOGS, THE SANDLOT 3: HEADING HOME, OFF THE MAP, 300, and BELIEVE IN ME. None of them are great movies, but certainly none are terrible and all of them have something to recommend them. On a health-related note, even though I’m on three different kinds of medication, my allergies have been bothering me all month. The past few years I’ve gotten pretty sensitive to ragweed, and this is supposedly the worst ragweed season in this part of Texas in more than fifty years. I check the pollen count numbers every day in the paper, and they’ve been higher than I remember ever seeing them, so I believe it’s as bad as the weather service says it is. The situation probably won’t improve until after the first freeze, which is at least six weeks away and quite possibly longer, since it still feels like summer here no matter what the calendar says. Other than that, though, September was okay. Here’s your inspirational, based-on-a-true-story sports movie for this week. It’s a good one, too. 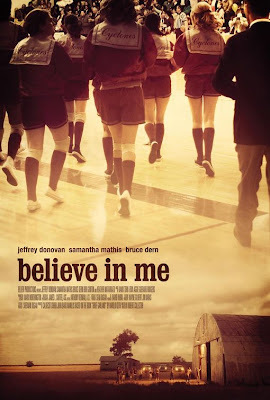 Set in drought-ridden western Oklahoma during the Sixties, BELIEVE IN ME is about a young basketball coach who comes to a small-town school believing that he’s been hired to coach the boy’s team. Instead, he’s given the girl’s team to coach. The girls have never been successful and are neglected by the school’s administration, but the coach sets out to change all that. All the typical elements of a movie like this are in place, right down to the coach’s supportive wife and the villainous head of the school board. It’s all beautifully photographed and well-acted and mostly predictable, but there are a couple of nice variations on the usual plot near the end that make this movie better than it might have been. Bruce Dern proves that he can be just as slimy and evil as a school board president as he was playing a psycho outlaw on GUNSMOKE or in John Wayne movies. Well, he’s not quite as evil here as he was in THE COWBOYS, I guess . . . but he’s still plenty despicable. All in all, BELIEVE IN ME is a fine entry in the sports movie genre and worth watching. Fender Tucker, the man behind the fine small press publisher Ramble House, has started blogging. You can check it out here. In the spirit of full disclosure, Fender and I are working on a collection of some of my mystery stories from MIKE SHAYNE MYSTERY MAGAZINE and a few other places. I don't know yet when it will be out, but you can bet I'll announce it here when I do know. As I’ve mentioned here before, one of my favorite pulp authors is H. Bedford-Jones, one of three legitimate claimants to the title King of the Pulps. (The other two being Frederick “Max Brand” Faust and Erle Stanley Gardner.) This short adventure novel was originally published in the August 2, 1919 issue of ALL-STORY WEEKLY. It’s the story of American reporter Eric Heald and British intelligence agent Major John Pendragon, who set off into the wilds of China (which were still pretty wild in 1919) to foil the plans of renegade Taoist priest Fang Tung. Fang Tung is trying to stir up a rebellion against the Chinese government, which was allied with England at the time. Along the way Heald and Pendragon pick up an ally, the beautiful daughter of an American doctor who established a hospital in China before his death, a hospital which the daughter still runs. This story would have made a pretty good 1930s adventure movie with, say, Gary Cooper, Victor McLaglen, and Myrna Loy. Warner Oland probably would have played the villainous Fang Tung, who can control men’s minds through hypnotism. His stronghold is an island temple in the middle of a lake, complete with secret passages, torture chambers, and other good stuff like that. Our heroes get captured, escape, and get captured again in the usual pulp fashion. The pace is a little slow at times and the prose is a little old-fashioned (imagine that, old-fashioned prose in a book that’s nearly 90 nears old), but everything finally builds up to a climax that’s very dramatic and effective, even if there’s not a lot of the slam-bang action you might expect. 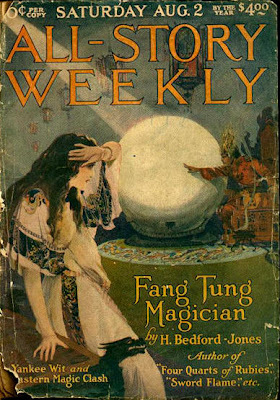 FANG TUNG, MAGICIAN would have to be classified as a “yellow peril” novel, and as such, it’s hardly what you’d call politically correct today. The characters are not as stereotypical as you might think, though, and Bedford-Jones was always good at providing heroes and villains of all sorts. I enjoyed the story quite a bit, even though it requires some patience, and if you like slightly cerebral pulp adventure yarns, I recommend it. A recent, inexpensive reprint is available from my friend Brian Earl Brown, and you can find information about it here, along with info on the other pulp reprints Brian has published. This book is either already out or will be any day now. Although the cover copy doesn't make any mention of it, Raider and Doc from the old J.D. Hardin series co-star with Longarm in this novel . . . for those of you who care about such things as old Adult Western series. 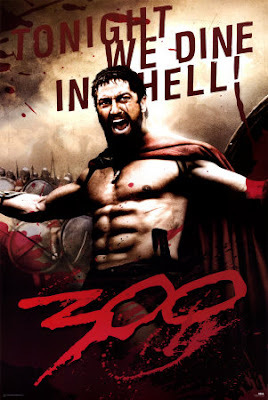 300 looks like nothing you’ve ever seen before. It also looks great most of the time with its mixture of CGI and very distinctive cinematography. I just wished I’d liked it more, because I really wanted to. You probably know what the movie’s about, whether you’ve seen it or not: the three hundred Spartans who stood off a huge Persian army at the battle of Thermopylae, or the Hot Gates, as it’s referred to in the film. 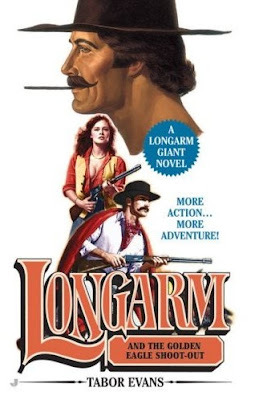 Having spent all my life in the same state where the Alamo is located, I’m a sucker for this kind of yarn, and I like the whole “honor and courage in the face of overwhelming odds” plot. But I thought the jerky, hard-to-follow, video-game-like battle scenes in 300 got old real quick, as did the buckets of blood being spilled. On the other hand, I really liked most of the quieter scenes where the characters are talking between the fights. There’s some excellent dialogue and acting to be found in those. While I like Frank Miller’s work in the comics and graphic novel format, I’m starting to think that it just doesn’t translate that well to film, at least for me. I didn’t care for SIN CITY, and while I thought 300 was better, my opinion of it is still mixed. 300 is okay at best, and I’m not sure I’d recommend it to anybody who isn’t really interested in the subject matter. 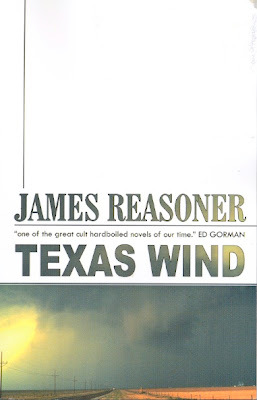 Nathan Cain over at the excellent Independent Crime website has posted a review of TEXAS WIND. I have to say, it's very nice to be getting reviews on this book almost thirty years after it was written. I’ve been a Cornell Woolrich fan ever since I encountered reprints of some of his pulp stories in EQMM and THE SAINT MYSTERY MAGAZINE during the Sixties. I’ve read many of his short stories and novelettes and enjoyed them all, but only a couple of his novels, the justly-famous THE BRIDE WORE BLACK and DEADLINE AT DAWN, which I also enjoyed. Until now. I’ve just read the recent Hard Case Crime reprint of Woolrich’s novel FRIGHT, originally published in 1950 under the pseudonym George Hopley. FRIGHT is one of Woolrich’s historical suspense novels, set in 1915 and 1916, and he does a fine job of recreating that era without going overboard on the historical details. The very strait-laced attitudes of the time period play a part in the plot, too, helping to drive the protagonist to do the things he does. It’s difficult to go into detail about that plot without giving away too much, but let’s just say there’s blackmail, murder, paranoia, more murder, doomed love, more murder, and tragedy galore. Pretty much the essence of noir, in other words, and all told in smooth, if slightly old-fashioned prose that keeps the reader turning the pages. Yes, the coincidences and lapses in logic that Woolrich is notorious for can be found in FRIGHT, but as usual the writing and the raw emotional torment he inflicts on his characters more than make up for any flaws. There are passages in this book that I found genuinely disturbing, and I’m usually not easily disturbed by fiction. FRIGHT is one of the bleakest books I’ve read in a long time. It’s also one of the best, and I have a feeling that it just might start me on a Woolrich binge. I don’t know if my heart can take it, though. Livia and I didn't think this one was going to be out until next week, but we spotted copies of it today in one of the chain bookstores in Fort Worth -- and took advantage of the opportunity to do a drive-by signing. (They had a couple of copies of DEATH HEAD CROSSING, too, so of course I scrawled my moniker in them.) 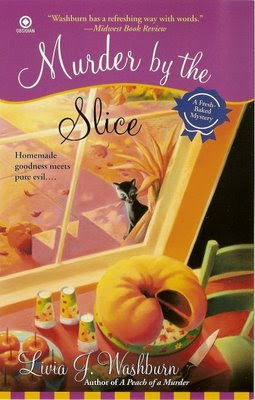 I'm biased, naturally, but I really enjoyed MURDER BY THE SLICE. I love the voice in these books, and it's got a nice plot with lots of twists. But don't take my word for it. Run right out and buy a copy so you can see for yourself. Years ago we watched the first SANDLOT movie, which I remember as being fairly entertaining for a kid’s baseball movie. We missed the second film in the series, but we recently watched THE SANDLOT 3: HEADING HOME. In typical fantasy fashion, a wealthy, self-centered professional baseball player gets hit on the head by a pitch and finds his adult consciousness inhabiting the 12-year-old body of his kid self, having to relive a pivotal summer in his life and decide whether he wants to follow the same course that he did the first time. Some of the acting is pretty bad and the lines that are supposed to be funny often aren’t, but I got kind of caught up in the story anyway. Nothing here will come as any surprise, but the movie is good-hearted and pleasant enough. OFF THE MAP is a coming-of-age story about a young, sensitive, intelligent girl who lives with her troubled but somehow still functional family in rural -- really rural -- New Mexico. It’s well-acted and the photography is beautiful. The movie is also arty, pretentious, and slow as mud at times. We picked this one up because Sam Elliott is in it and he’s one of our favorite actors, but he’s not given much to do here except sit around and mope. Kind of like the SANDLOT movie, though, I got interested in this one despite its problems. Joan Allen is good in it, and Valentina de Angelis, who plays the kid, is really good. Worth watching, but you should know going in that it’s definitely leisurely paced. However, as I mentioned to the rest of the family after we’d watched it, sometimes you just need a break from Stuff Blowing Up Real Good, Will Ferrell running around in his underwear (or less), and inspirational, based-on-a-true-story sports movies that include at least one scene where the coach makes the team run back and forth across the field, or the court, or whatever, until they’re ready to drop. OFF THE MAP fits the bill for that. For years I’ve heard good things about Richard Matheson’s early suspense novels, but I’d never read any of them until now. 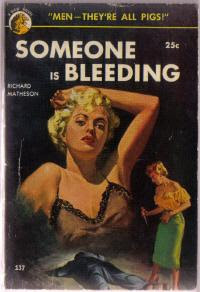 SOMEONE IS BLEEDING was in fact Matheson’s first novel, published by Lion Books in 1953. That’s the cover from that edition you see over to the left, but I actually read the novel in a much more recent trade paperback omnibus edition published by Forge Books, which also includes FURY ON SUNDAY and RIDE THE NIGHTMARE. I’ll be reading them soon, I hope. SOMEONE IS BLEEDING is the story of young would-be author David Newton, who goes to California to write novels after seeing action in Europe during World War II. Some of this background is drawn from Matheson’s own life, but not, I hope, the main storyline, which finds Newton meeting and falling in love with a beautiful young woman who may or may not be a psychotic killer. Matheson keeps the story racing along, throwing all sorts of obstacles in the path of Dave and the beautiful but possibly deadly Peggy, including a shady lawyer, a former mob hitman working as a chauffeur, a dogged police detective, and a series of ice pick murders. The introduction to the reprint edition mentions that Anthony Boucher’s review of this book compared it to the work of Cornell Woolrich, and I can see that. Dave Newton is very reminiscent of some of Woolrich’s everyman protagonists who find themselves caught up in nightmarish, dangerous situations. My reaction to this book was rather mixed. Matheson’s spare prose is very effective most of the time. The plot twists back and forth quite a bit, which I like, and the portrait of post-war Los Angeles is good. There’s a great chase scene, something you usually think of more in terms of movies than books, but Matheson sure makes it work here. And the book has a real punch-in-the-gut ending. However, at times the writing seems more rushed and incomplete than terse, and Dave Newton is so wishy-washy that it’s kind of hard to root for him. He also has a habit of doing dumb things for no good reason other than to keep the plot moving along. Overall, though, Matheson’s ability to create an atmosphere of tension and menace and dread is enough to overcome those problems, I think, making this a book that’s well worth reading. And I certainly enjoyed it enough to look forward to reading the other two books in the reprint volume. When I mentioned the novels based on the Rat Patrol TV series a while back, I said that there were five of them. Well, I was wrong. 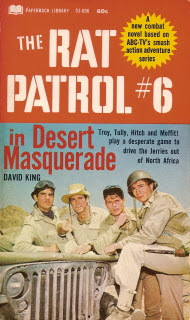 There were actually six Rat Patrol novels, and thanks to Scott Cupp, I’ve now read that elusive sixth one, DESERT MASQUERADE. Those of you old enough to remember the TV show probably recall the set-up as well. Four commandos (three Americans and a Brit) run around North Africa in a couple of jeeps equipped with .50 caliber machine guns, harassing Rommel’s Afrika Corps in general and one officer, Captain Hans Dietrich, in particular. DESERT MASQUERADE varies quite a bit from that typical scenario and is more of an espionage yarn, with the four members of the Rat Patrol operating in disguise behind enemy lines as they try to obtain some vital information that will allow the Americans to break a stand-off with a German armored column commanded by Captain Dietrich. For the most part this novel is a comedy of errors as the author cuts back and forth between the Rat Patrol, the rest of the American force, and the Germans under Dietrich. Everybody thinks they know things they really don’t. Most of the mistakes result from false information being sold to both sides by a group of Arab spies. Everything finally works out so that the Rat Patrol emerges triumphant, but hey, you knew that going in. I don’t know much about the author, David King, except that his real name was Howard Pehrson and that in addition to five Rat Patrol novels, he wrote a few other war novels and some Westerns as King and also contributed a couple of early books to the long-running adult Western series Slocum, as by Jake Logan, including the first book in the series. DESERT MASQUERADE kind of pokes along in places but ultimately is pretty entertaining if you’re a fan of the TV series, as I was -- and am, since I’ve watched a few episodes from the DVD set Livia gave me for our anniversary last month and so far they hold up pretty well. The music cues seem a little too dramatic and overdone now, but that’s Sixties TV for you. The location filming, with Spain standing in for North Africa, is spectacular. I’m enjoying the show so far and expect to continue doing so. The plot of WILD HOGS is pretty simple: four middle-aged men who have been friends since high school (Tim Allen, John Travolta, Martin Lawrence, and William H. Macy) get together occasionally to ride motorcycles. They call themselves the Wild Hogs and dream of getting away from their pleasant but mostly boring lives. Prompted by Travolta’s character (whose life is falling apart, unknown to the others), they decide to ride across the country from Cincinnati to the West Coast. Adventures and hilarity and the occasional poignant moment ensue. WILD HOGS is a little by-the-numbers, but it’s good-hearted and a lot of fun. Some of the humor is on the crude side, but not excessively so. I like all the actors involved (especially William H. Macy), and there’s a good supporting cast, too, including Peter Fonda as, what else, a legendary biker. The soundtrack, featuring all sorts of road music, is excellent. 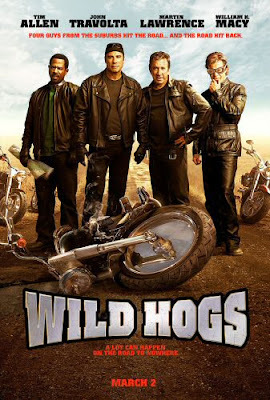 WILD HOGS doesn’t break any new ground, but it’s funny and does a good job covering the ground that it does. DÉJÀ VU opens with a terrorist’s bomb blowing up a crowded ferry crossing the Mississippi River at New Orleans, killing more than five hundred people. 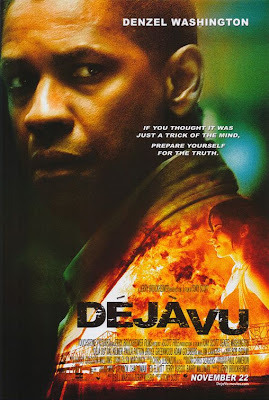 Denzel Washinton plays an ATF agent helping to investigate this atrocity, and when he gets a call from the morgue about a female victim who washed ashore, evidently having been killed in the blast, he discovers that she actually died before the explosion and realizes that things aren’t as simple as they appear to be. This movie starts out as a well-done but fairly typical feds-on-the-trail-of-the-terrorist thriller, but the more evidence Washington’s character uncovers, the weirder things get. Then the story takes a decidedly science-fictional turn. I can’t say much more about the plot without ruining things for those of you who haven’t seen the film. There’s nothing here that will come as much of a surprise to anybody who’s seen or read very many near-future scientific thrillers, but it’s handled pretty well, with good action scenes, some likable characters, and the sort of semi-plausible scientific gibberish that’s always good for a grin. I’m not very fond of director Tony Scott’s jumpy style, but he keeps it under control fairly well in this film. DÉJÀ VU is a pretty entertaining couple of hours. 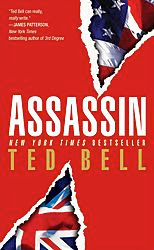 ASSASSIN is the second book in Ted Bell’s series about Lord Alexander Hawke, British nobleman, billionaire businessman, and freelance secret agent for the British and American governments. These books are deliberate throwbacks to the more outrageous espionage novels of the Sixties, with larger-than-life heroes and colorful, eccentric villains bent on ruling and/or destroying the world. Bell has updated that whole scenario for a post-9/11 world, of course, and the bad guys in this book are Islamic terrorists who are a. systematically assassinating American ambassadors and their families worldwide, and b. working on a concurrent plot to launch a devastating attack against the United States on American soil. Obviously, the only man who can deal with this terrible danger is Alex Hawke, even though a mysterious enemy from his past is seeking vengeance on him at the same time. There’s a lot to like about this book. Hawke and his friends and allies are an appealing bunch, and the last 150 pages are filled with action and very suspenseful. Before that, though, the plot meanders around quite a bit and seems to take a long time to develop. There are nice set pieces all the way through the novel but too many of them have long stretches between them where nothing much happens, giving the book a padded feeling, something I didn’t think happened in the first book. Maybe I just read it too soon after HAWKE, the initial entry in the series. Overall, I enjoyed ASSASSIN enough that I’ll definitely continue to read the series, but I’ll probably let more time go by before I tackle the third book, PIRATE. So you’ve got this big, tough Marine, John Triton, who gets thrown out of the service because he disobeyed orders and singlehandedly saved several other Marines who had been captured by the enemy in Iraq. Triton comes back to his beautiful wife in the United States and has a predictably hard time fitting into civilian life. At the same time there’s this ruthless gang of professional jewel thieves who are on the run after pulling a big robbery. You know they’re going to cross paths with Triton sooner or later, and when they do . . . well, the story could go one of two different ways. Either it becomes a taut little noir thriller, or it turns into a noisy action/adventure film with lots of running and fighting and shooting and things Blowing Up Real Good. 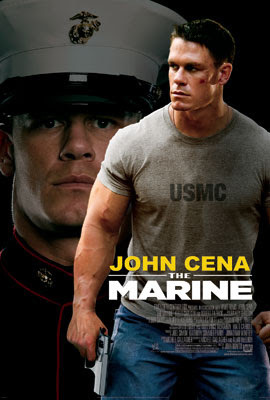 Since THE MARINE is the first starring vehicle for WWE performer John Cena, who’s attempting to follow in The Rock’s footsteps and become an action movie star, you can probably guess which path this story follows. That said, THE MARINE is very entertaining and well-written. There’s a thread of dry humor that runs all through the film, resulting in lines like the one delivered by Robert Patrick, playing the leader of the bad guys, who orders everyone not to look at him during the big robbery early in the film: “I have intimacy issues . . . and a gun.” By the time John Triton leaps toward the camera with some huge explosion going off right behind him for the third or fourth time, you get the idea that the filmmakers aren’t taking any of this too seriously and neither should we. It’s just a goofy, over-the-top action movie, but a slyly intelligent one at the same time. Not surprisingly, John Cena has an impressive physical presence, and while the script doesn’t call for him to do much more than run and jump and fight, he handles the few quieter moments pretty well, too. Dwayne Johnson -- The Rock -- was a decent actor right from the start, and Cena may prove to be, too. I liked THE MARINE quite a bit and recommend it to those who like action/adventure films. THE EX is an enjoyable little romantic comedy that finds Zach Braff of TV’s SCRUBS somewhat typecast as a lovable, mildly nebbishy screw-up with a beautiful wife (Amanda Peet) and a new baby. After losing his job yet again, Braff’s character decides to move his family from New York to Ohio, where his wife is from, and go to work for her father, who works for an advertising agency. Pretty standard stuff up to that point, but then Braff’s immediate superior at the ad agency turns out to be his wife’s old high school boyfriend, who’s in a wheelchair and was back in high school, too. As played very well by Jason Bateman as a smarmy, apparently charming sociopath, this guy turns out to be the villain of the piece and gives the movie a bizarre edge that lifts it out of the commonplace. Short, fairly funny, and well-written, THE EX is worth watching. Several things came together just right recently to keep me really busy for a while. First of all, the current manuscript was at a fairly critical point in the writing. Then another project came up unexpectedly, and I had to spend quite a bit of time researching and plotting, then writing an outline for it. Finally, yesterday was my father-in-law’s 80th birthday, and Livia and her brother put on a big birthday party/family reunion for him. I didn’t have to do a lot to help with getting ready for that, but it did require me to spend most of yesterday eating mass quantities of excellent food and visiting with relatives, some of whom I hadn’t seen for quite a few years. Now, though, I have that manuscript where it needs to be, the new outline is done, pending any necessary revisions (and I wrote an outline for a series Western novel while I was at it), and the party is over, so I can get back to more normal activities like writing a belated end-of-the-month update for August. Even though the pace got a little more hectic toward the end of the month, I was working hard all through August. It wound up being one of my most productive months ever, somewhere in the top five all-time, I’d guess. But not a record; that much I’m sure of. Still, I was quite pleased not only with the amount of work I got done but the quality of it as well. If something comes of this new outline, which is for a book that will probably have my name on it, then it will have been a good month indeed. I enjoyed all these books and will soon be reading more in Ted Bell’s Hawke series (I already have the next two, ASSASSIN and PIRATE) and the Carl Wilcox series by Harold Adams. These are the movies we watched in August: HART’S WAR, HIGH SCHOOL MUSICAL, TALLADEGA NIGHTS, CAT ON A HOT TIN ROOF, DETOUR, DUPLEX, DURANGO KIDS, FLYBOYS, DUMA, and ROCKY BALBOA. I’ve already posted about all of these except the Rocky movie, so I’ll take this opportunity to say that I liked it quite a bit, probably because it’s more like the first movie in the series than any of the others, and the original ROCKY is one of my favorite films. Some of that is probably based on nostalgia -- Livia and I were still newlyweds when we went to see ROCKY (at the old Wedgwood Theater in Fort Worth, if I remember right) and we watched the Academy Awards ceremony at which it won Best Picture in the first apartment where we lived. ROCKY BALBOA provides a really nice wrap-up for the series, and I hope Stallone resists the temptation to make any more. As for the rest of August’s movies, you’ve got a classic film noir, a young Elizabeth Taylor in lingerie, World War I flying aces, and one of the funniest bits I’ve ever seen, the post-closing-credits ender in TALLADEGA NIGHTS. Not a bad month. Which is true for August overall. Not a bad month. Just really, really tiring. I hope all of you who celebrate Labor Day had a good holiday.